The Bannockburn exhibition at the Smith has some interesting new works of art. This painting, oil on panel, of Bruce slaying de Bohun is by the highly acclaimed London artist, Liz Knutt, who belongs to the Teddington Group. Liz Knutt trained at Edinburgh College of Art and spent many years in the West Indies, which ignited her love of colour. She is well known for her paintings of views and events in Richmond upon Thames. Under the title ‘Theatreland Richmond’ she produced paintings featuring ‘Leap into Dance’ productions and studies of Richmond Theatre. Two of her paintings have been hung in the theatre itself. The Royal Botanic Gardens purchased the painting of Jools Holland’s Concert. This painting was considered an essential addition to the Kew collection of Art. Having also purchased the copyright of this stunning piece, Kew used this vibrant image to market the Summer Swing Festival. Her reputation as an artist meant that she was granted unrestricted access to Hampton Court Palace to produce a series of paintings. The Peugeot Car Company bought a view of the Palace painted from the river. The original was presented to the director of the company and sixty prints to guests who attended the gala dinner at the Palace. Liz’s latest paintings depict scenes from London and of the ice skating rink at Hampton Court. She has also just finished a gorgeous series of paintings of the refurbished Strawberry Hill House. Her picture of Bannockburn is an important contribution to a 150 year artistic heritage of depicting the Battle, and prints can be bought at the Smith. 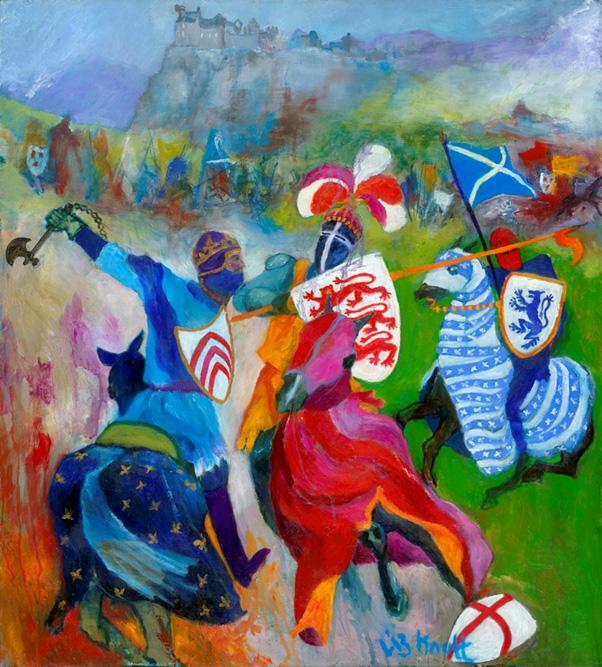 I have a limited edition print of Liz Knutt’s “A London View of The Battle of Bannockburn, how much is this worth please. I am afraid we cannot value items for legal and ethical reasons. You have to go to auction houses for that.